Fairy Dust incense smells light, delicate and crisp, and the iridescent sparkles on the end of the stick help create the fantasy of a magical encounter with shining fairies. 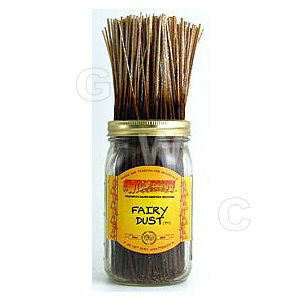 Fairy Dust incense offer a citrusy blend of scents, designed to mask smoke odor. Wild Berry uses only the highest quality fragrances and a secret ingredient insures the fragrance stays fresh and smells the same on the stick as it does when it burns. Each Wild Berry Incense is aromatic and sensual in its own way. Wild Berry incense has been lovingly hand-dipped since 1971. Each incense stick is made from proprietary formulas of only the finest ingredients. Wild Berry guarantees their incense to be fresh and rewarding to the senses A stick of Wild Berry incense will burn approximately 1 hour.